SleepyIze Essential Oil for Children sets the environment for restful and peaceful sleep. Gentle and supporting specifically formulated for kids! Diffuse before bedtime or place on the bottom of the feet to unwind from the day. It is a wonderful blend of eight different essential oils that is part of the KidScents Collection Kit. Essential oils for children that are pre-diluted. This is an easy reference guide for SleepyIze Oil Blend. It will tell you how to use your oil blend and what to use it for. It will also provide you with some fun tips and testimonials! Want to Purchase Therapeutic SleepyIze Essential Oil? Go to the Oil Shop! Buy SleepyIze Oil Here! What is in SleepyIze? There are eight different essential oils in SleepyIze. They are listed below along with a brief description of each oil. Sacred Frankincense Essential Oil (Boswellia sacraa) is high in sesquiterpenes which helps to uplift spirits and promotes relaxation (overcome stress). This is thought to be the original oil given to baby Jesus. Valerian Essential Oil (Valeriana officinalis) from the root has been used for centuries. During the last three decades, it has been clinically investigated for its relaxing properties. Researchers have pinpointed the sesquiterpenes, valerenic acid, and valerone as the active constituents that exert a calming and restorative effect on the central nervous system. German health authorities have pronounced valerian to be an effective aid for the body's needs*. Rue Essential Oil (Ruta graveolens) Emotionally, it is relaxing and releasing. What are the Documented Uses for SleepyIze Oil? Aids in relaxation and unwinding before bed or anytime during the day where quietness is wanted. Promotes restful and peaceful sleep. What is the Aromatic Affect on the Mind? Quieting and relaxing. What is the Spiritual and Emotional Influence? This oil will help children and animals center and quiet their mind and body after an emotional or stressed filled day. Sometimes even when children are tired the mind races from over stimulation. This will teach children how to wind down and create healthy bedtime habits without so much resistance. What Chakra is Affected? Sacral, solar plexus, throat, third eye and crown chakras. Can this Oil be used for Animals? Yes! Definitely use it for dogs and horses. The animals love the kids oils since they are so gentle! Pet your dog head to toe before bed to help them ease to bed. What are the Safety Precautions? If pregnant or under a doctor's care, consult your physician. Dilution not required; suitable for all but the most sensitive skin. Generally safe for children. 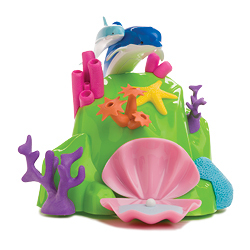 Place in the Dino Land Diffuser or Dolphin Reef Diffuser before bedtime or after a hectic day.